Mr Hancock told the BBC's Today programme: "We are looking at legislating for the duty of care that social media companies in particular have towards the people on their sites - this is an important part of that duty of care alongside all the other things that social media companies need to do, like tackling material that promotes suicide and self-harm and, of course, terrorism." In a statement Facebook, which owns Instagram, said: "We are working to tackle vaccine misinformation…by reducing its distribution and providing people with authoritative information on the topic." There have been measles outbreaks in parts of the US. Rockland County in New York State has declared a State of Emergency in response to the outbreak there. Anyone who is under 18 and unvaccinated will be barred from all public places until the declaration expires in 30 days or they get the MMR vaccine. Breaches of the order will result in a fine and a six month jail sentence. In January officials in Washington State announced measures to help local areas worst affected by the virus. This is below the 95% said to provide "herd immunity", the level considered by experts to protect a population from a disease. 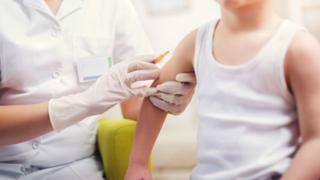 Prof Dame Sally Davies, England's chief medical officer, believes anti-vaccination campaigns are damaging and should be vigorously resisted: "I don't like it that bad science is pushed to parents - I don't like quackery - I want them to know the truth that vaccines are very safe that have been used for decades". Sarah is now bedbound and needs 24-hour care. Jo has become a committed campaigner for the MMR jab: "It upsets me greatly that here we are 14 years after Sarah's diagnosis and people seem as ill-educated about the consequences of childhood illnesses as I was back in 1980." As the chief medical officer put it, the UK's health system is not an island when it comes to the spread of viruses.